Sambuccus nigra both flowers and berries of this lovely small tree can be used for unique flavoured drinks, syrups, pies and lots more. Insects love the scented flowers in June and birds love the berries later. 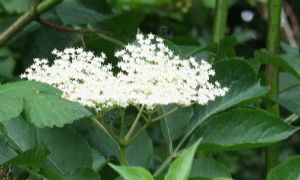 This plant can be planted as part of a wildlife hedge and does not mind being cut back.